Where to find Tancarville hotels near an airport? 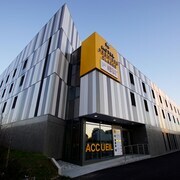 Where can I find hotels in Tancarville that are near tourist attractions? As there's only 1 quality hotel option within a 0.1 kilometres (0.06 miles) of downtown Tancarville, it's worth booking a place to stay early. 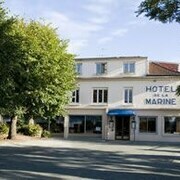 One of only a handful of hotels within walking distance to the center of Tancarville, is the De la Marine. 18 kilometres (11 miles) from the middle of Tancarville, is the La Ferme Saint Simeon. The Auberge de la Source is 20 kilometres (13 miles) away. The Belle-Isle sur Risle and the Le Petit Coq Aux Champs are two alternative places to stay in Tancarville. Eu is 95 kilometres (58 miles) to the northeast of Tancarville and is home to the Chateau d'Eu and Jardin Jungle Karlostachys. 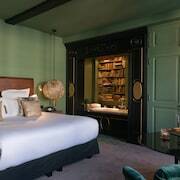 The Domaine de Joinville & Spa and Inter Hotel La Cour Carree are some of the Expedia-recommended apartment and hotel alternatives in Eu. 30 kilometres (19 miles) to the north of Tancarville, is Fecamp, which is home to the Le Grand Pavois and Inter-hotel D Angleterre. The Fecamp Beach and Benedictine Distillery are a couple of the more popular places to experience when you're in Fecamp. Why not spend a few hours rubbing shoulders with fellow sports enthusiasts at a local sporting fixture. Deauville La Touques Racecourse is 30 kilometres (19 miles) to the southwest of Tancarville. 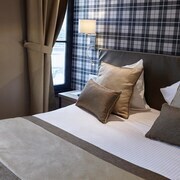 For travelers who are keen on booking accommodation nearby, make a reservation in the Hôtel Barrière Le Royal Deauville or Hôtel Barrière Le Normandy Deauville. Saint-Gatien Airport is a practical airport, and is 25 kilometres (16 miles) from Tancarville. 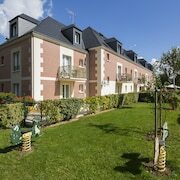 Conveniently located Expedia-listed hotels are Manoir de la Poterie & Spa and Le Clos Deauville Saint-Gatien. 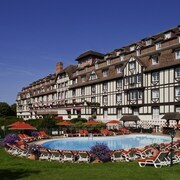 What are the most popular Tancarville hotels? Are there hotels in other cities near Tancarville? What other types of accommodations are available in Tancarville? Explore Tancarville with Expedia.ca’s Travel Guides to find the best flights, cars, holiday packages and more!